Welcome to Boston Mamas Rock! – where we’re giving a voice to fabulous local mamas from all walks of life. Read on for today’s interview with Lauren Hefferon, mother of three, avid cyclist, and director of the bicycle tour group Ciclismo Classico. Then go ahead and nominate yourself or a friend! Christine: Welcome, Lauren! I was so fascinated to read about your international company based right out of Arlington. Tell us a little bit about your background. You studied anthropology at Cornell; what path led you to starting your bicycle vacation business Ciclismo Classico? Lauren: I started cycling longer distances and really began to embrace cycling passionately when I was a freshman in high school. I was very active and played many sports but once I tore cartilage and had knee surgery I realized that I had to find a sport that was low impact yet fueled my desire to be very active. During my tumultuous teenage years, cycling was both a safe and positive escape. I remember packing my lunch and taking off for the entire day to ride to my heart’s content around Southern NH (and worry my parents to death!). I would stop at general stores, churches, graveyards, whatever tickled my fancy; every summer following was mine to ride and explore where I lived and beyond. My high school graduation adventure was a two-week bike camping trip up the Maine coast to Nova Scotia with five guys and myself; only three of us made the whole trip. When it came time to choose a college, I chose Cornell not only for its education but also for the incredibly beautiful Finger Lakes as a cycling destination. My father at first was concerned about getting my priorities straight but he knew that if I was cycling daily in a place that I loved that I would be happy and would thrive. At Cornell I immediately signed on to lead bicycle-touring classes for their Wilderness Reflections program that orientates new students via experiential outdoor programs. In terms of academics, my major was anthropology, which perfectly fit my adventurous and culturally curious spirit. I started to see myself as a cycling anthropologist - wherever I rode, I would observe and appreciate the subtle variations and unique qualities of the people, traditions, and places I experienced. Envisioning guiding in my future, I did a six-week National Outdoor Leadership backpacking training course (NOLS) in the Wind Rivers of Wyoming. I absolutely fell in love with the leadership learning experience and began to pursue other leadership opportunities, including working as bicycle tour guide for Interlocken International Kids Camp (now know as Windsor Mountain). Upon graduating from Cornell, I received a Rotary scholarship to study art in Italy, the native country of my grandparents. Before beginning my studies in the fall of ‘83, I embarked on my first solo bicycle-touring trip through Europe. The multicountry camping bike tour, starting in Italy, was three months and 3,000 miles long. During the tour (that wound its way through my grandmother’s home town) I took notes, recorded my route, and presented my Rome to London itinerary to Camp Interlocken’s Research and Development director. With his blessing I launched my career in itinerary development and the following summer led my first six-week Rome to London camping tour with 14 teenagers. It was the hardest job of my life but I loved it. I was hooked and it was one of their best selling itineraries. During my three-year stay in Italy, I rode, raced, and explored every road in Tuscany and envisioned leading tours through this gorgeous countryside. I returned to Boston in 1986 and after dabbling with an art degree, and some waitress and temp gigs, I knew that the only person I could work for was myself. I jumped off the diving board, developed a couple of itineraries in Tuscany, designed a simple brochure, and hit the road smiling and selling what I loved. Christine: Your tours are now international, but when you started the business, did you have to start smaller while you developed a client base? What was your first expedition and how did you find clients for that first journey? Lauren: I launched my first two tours in June of 1989 for a grand total of 18 guests (we now have over 1000 per year on 85 tours). Both these tours were in Tuscany, a region I know like the back of my hand. My approach to getting clients was pure gorilla marketing: cheap ads, handmade posters, letters to friends, and hundreds of phone calls. The following year my then future husband Mauro got involved and we had five tours and 60 guests and continued to double and triple our business every year until 2001 when the world as we know it changed and all travel companies had to evolve and adapt to a new world of travel. Christine: Your 3 children were born while your business was developing. What were your key strategies for juggling motherhood and work during this busy time? Lauren: Very early on I realized that I could not do it all so I learned the importance of hiring people and effectively delegating. This strategy helped both in raising my kids and running the business. I have had a wonderful Italian A+ nanny (Natascia) for over nine years; I can completely entrust her with my children and have peace of mind while I worked. As my company grew I continually tried to hire staff to assume more and more responsibility. I have always benefited in having a strong number two person. When I started Ciclismo, I was blessed to have found a remarkable individual, Marisa Caruccio, who perfectly balanced my weaknesses with her strengths. When, due to my growing family, we could not spend enough operational time in Italy, we hired Davide Marchegiano to run our Italian operations. He has done a better job than I ever could have in growing our guide team, running our operations, and expanding our product line throughout Europe. Recently I have hired Andrew Conway, as our Managing Director to drive sales and marketing and oversee our USA operations. Another strategy that helped me balance, prioritize, and keep focused was to join and align myself with other like-minded business organizations and individuals who have been through the same life and businesses challenges. While your family and team can be very supportive, it is important to keep learning and growing professionally. Christine: Tell us more about the family trips that you have created at Ciclismo. What might a family of 4 expect to pay for a cycling adventure? 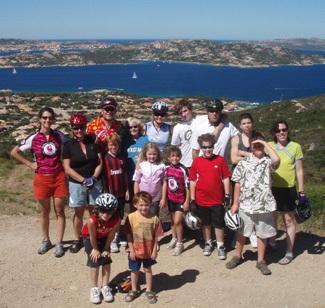 Lauren: We have several family tours including our Tuscan Fantasy, our Mediterranean Multi Sport, and our new New England Adventure. All of these trips are designed to be active cultural immersions into the sights and sounds of the region for families with kids from 6-18. Each tour has rides of all lengths and abilities and has activities such as pizza making, a bocce tournament, and language lessons for kids and their parents when they are not cycling. Our New England family adventure will have daily loop rides in Northern Vermont as well as visits to the Shelburne museum, a bird museum, blueberry picking, Vermont lost arts and crafts, music lessons, and stargazing with a local astronomer. A family of four can expect to pay $6,500 to $12,000 depending on the type of itinerary. Christine: Your nominator wrote that you are very active at a local level with your cycling. Tell us about the causes that are near and dear to your heart, and how you have supported them via cycling. Lauren: The organizations that are near and dear to my heart include the Pan Mass Challenge (cycling cancer fundraiser), Cycle Kids (kids cycling education non-profit), Bikes Belong (national cycling organization), Sustainable Business Network (promoting local and sustainable business), The Social Venture Network (progressive socially responsible business), Go Green Streets (promoting alternative transportation in Cambridge and beyond), Safe Routes to School, and of course Mass Bike (the statewide advocacy organization). Over the past six years, I have been very active in trying to raise awareness, encourage, and support the initiatives of Bicycle City, whose motto is Drive Less, Live More. Specifically, I have applied the concepts by promoting kids and parents to cycle to school in Arlington. My kids and I have always walked or ridden to school. This fall my 4th grade daughter has logged on 120 miles in her 4-mile commute back and forth to the school. My kindergarten son bikes a total of 1.2 miles a day and loves it but is not allowed to park his bike on school property. A steep and enormous hurdle for cycling to school is that for many years the Arlington principals have had an unwritten, nonsensical ban on bicycling to school and parking on school property. This lack of active encouragement of alternative transportation has resulted in many more parents driving to school and an enormous traffic problem around the schools. Just like in most of America, the car culture is very strongly embedded in the Arlington mindset even though the country’s most populated bike path runs through the entire town and if need be, a person could use the path to access shopping, entertainment, schools, restaurants, movies, and daily errands. Even though the car culture is winning, because of health, environmental, and societal issues, bicycling is making a comeback; it’s not that hard but it does take rethinking your day and your habits and being prepared differently than for a car. I believe the bicycle, with its health, social, transportation, and environmental benefits, should be the symbol of the NEW green revolution. Christine: Your nominator also said that you pedal 50+ miles a day! As someone who used to be very physically active but can’t seem to fit in exercise anymore, tell us how you fit this into your schedule. Lauren: Well, it is more like 20-30 miles a day, four to five times a week but I do bike everywhere so my daily commutes to drop off my kids and errand running can easily add up to at least 10 miles a day. After I drop off my daughter by bike, I do my 30-mile loop to Concord and call in for our 11:00 daily huddle at work. In the winter I cross-country ski, walk, do yoga, and spend a bit of time at the gym lifting weights. Although I am challenged by many habits, ever since I was a kid, I have always made daily activity and healthy eating a top priority and part of my life. I have really reaped the benefits: I very, very rarely get sick, my energy level is high, and physical activity always clears my mind and reduces any stress. Cycling gives me some valuable alone and thinking time too - my best ideas come when I am cycling! Since it is hard to find time to exercise, the easiest way to remain active is to blend high activity into your daily work and play. In my house I have a two-mile rule: anything under two miles and we walk or bike. Have your own two-mile rule. Limit your car usage by keeping your life needs and wants local: walk or bike to work, to errands, to entertainment. Commuting, even if it’s only a few miles a day, will keep your metabolism running at a higher rate. Christine: So I have to admit that I have a bit of bike trauma. I used to love riding but then I bought my first bike (as an adult) and it got stolen 2 days (one glorious ride) later in Somerville (it was completely locked up). I haven’t been able to bring myself to buy a bike since. Do you have any recommendations for functional but affordable bikes for the lay cyclers out there? Lauren: There are plenty of great bikes out there but you must always lock them properly to a rack with a Kryptonite lock or you at risk of getting them stolen. Although I am dedicated to cycling, I am not much into all the new brands and gadgets. I do have many bikes for various purposes. I have my super fine Serotta racing bike that I do long fitness rides on. I have a couple of tandems that I use with my kids. My clunky commuting bike is a Trek Mountain that I spray painted gold, added fenders, a light, and rack. I use this to go everywhere and I love it. If you want a decent bike for recreational riding, most of the brands are very competitive so go to your local bike shop, tell them your price range and needs and they can set you up for $400-$700. A clunky multipurpose commuting bike can be found on Craig’s list for $150-$300, but I like to support my local bike shop whenever I can. Christine: I’d also be interested in your perspective on safety with kids and bikes. I get so nervous when I see (or need to negotiate around) those back-of-bike attachments that are closer to the ground and to the cars behind it. In your opinion, what are the safest ways to bike with babies and kids in tow? Do you have any gear recommendations? Lauren: First, parents must get educated and outfitted with the best equipment they can afford. Parents must model proper cycling safety and etiquette, including always wearing a helmet, dressing brightly, obeying traffic laws, and sharing the roads with cars and pedestrians. Kids can and do cycle safely but parents must be the strict enforcers. I have always used a Burely or trail-a-bikes with my kids and as long as they are a good quality and mounted properly they are a perfect solution. For parents with babies, a good bike seat mounted on rear rack or a Burley works perfectly fine. For older kids make sure to get a bike that is made well and can be serviced. There is a lot of junk out there and kids will quickly lose interest if their bike breaks or does not work properly. My kids started riding a two-wheeler at around five. For kids between 6-8 a one-speed is better than a gear bike. Older kids can begin to learn and benefit from a gear bike but not until kids are about 10 will they be able to really process everything around them and make proper decisions. Make sure that a child dresses brightly, has a helmet that they like (color and design) that fits properly and is always buckled snuggly. I got my kids a horn, a light, and cycling gloves so they have a good grip on the handlebars. Always make sure your kid’s tires are inflated, and that the bike is working properly. I always ride beside my kids or closely behind them and am constantly teaching them bike safety and giving them mini-lessons such as how to ride in a straight line, shift, break, listening for cars, etc. Since I always want to reward my kids for cycling, when we take longer rides we stop whenever they want for ice cream, snack, or playgrounds. Rides over 5 miles will quickly bore and tire out any child so you have to be patient and willing to lower your expectations. Christine: Obviously, cycling is at your professional and personal core. Tell us about other favorite things you do to unwind or any hidden/unusual talents you may have. Lauren: To unwind, I stay up late and enjoy the absolute peace and quiet by reading, writing, planning, and learning about new places, people, and things via a growing number of blogs I subscribe to. I am not one to stay home much. I do love spending time with my family and am very involved with my children’s lives. I love experiencing all the wonderful cultural and outdoor events in the Boston area with them. I have gained the reputation of being the Daytrip Diva because I am always planning an outing or a day trip. This year I have made a commitment to learning the guitar. I have been trying to play daily and even though I only know a few chords it is very relaxing. Photography gives me great satisfaction but it has been hard to make the time to really invest the time to learn and expand my horizon. I would love to learn film-making! I love to sing and have finally joined The Mystic Chorale. I also love to get together with friends whenever possible; sharing ideas and tales is wonderfully nurturing and uplifting and I do this through taking classes, attending conferences, and writing on my blog. Of all my outlets, travel is my ultimate escape; I am much more myself when I am on the road, exploring and reacting to new places and people. One dream I have is to travel around the world with my kids for six months. 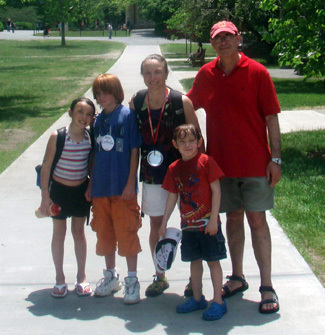 Lauren: Even though I regularly fantasize about relocating to a smaller college town like Keene or Northampton, I have been in the Boston area now for over 20 years and despite the challenges of urban living, this area and its variety of people, places, and culture does have a hold on you. Since I do love to bike everywhere with or without children, I feel that I can access the majority of my business, personal, practical, and social needs by bike. The Boston area offers such a great variety of cultural and educational experiences for all ages; there is always something fun and unique to do. Living in the Boston area allows me to be primarily car-free and that is very important to me. Boston is a beautiful and very special place. 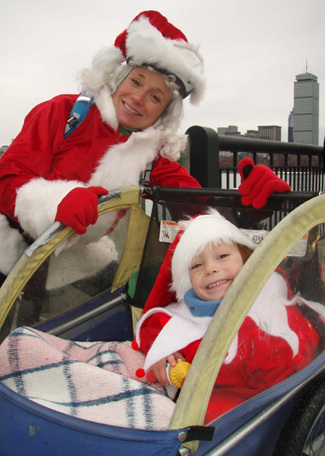 Every season offers amazing events like the marathon in the spring, various street festivals in the summer, fall foliage exploding along the Charles River during the regatta, and vast holiday events including our very own Jingle Ride, a ten mile costumed bike ride through the streets of Boston. Being a Boston mama means I dress like a reindeer, ride my bike through the streets of Boston, and get my picture taken with a tin soldier in Faneuil Hall. How much better does it get?